It is with an almost peaceful sadness we bid farewell to one of the most beloved franchises of all time. Peaceful in that we and the characters are sent off with a soft, tranquil, almost melancholy feel yet it is with deep sadness we know we will never get to visit these characters again. Through ten years and eight films we have grown to know and love each of these characters, even the smallest of roles have been here since the beginning and to go out with a bang is somewhat of an understatement when talking about "Harry Potter and the Deathly Hallows Part 2". With a scope larger than any other Potter film, the underlying meaning and substance of every scene seeping through and resonating with the audience this is not only a great Harry Potter film, but a great film in general. Granted, if you haven't seen any of the other films you will be completely lost going into this one but if you haven't seen those you most likely won't see this one and thus this review will be completely written from the point of view of a Harry Potter fan, one who grew up reading the books and saw every film opening weekend. 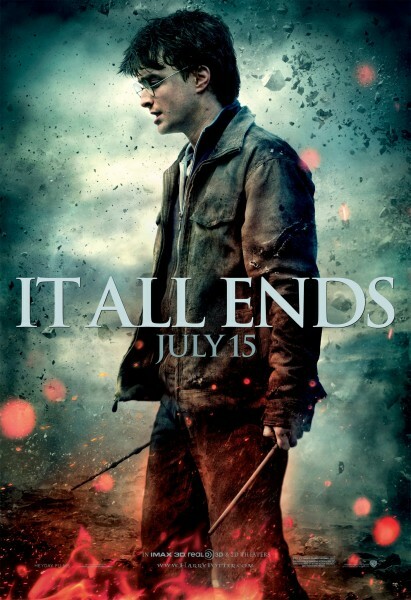 One whose childhood feels as if it is coming to a close with this final Potter film. I'm just saying, there may be a little bias in my opinion. You've been warned. ingredient for some Polyjuice Potion. Part 2 picks up exactly where Part1 left off. Voldemort has raided Dumbledore's tomb and stolen the elder wand. Harry, Ron, and Hermione have just escaped the clutches of the death eaters and buried their loyal elf and friend, Dobby. What they need to be doing is finding the final horcruxes (seven objects that the evil Lord Voldemort has stored bits of his soul in) so that the physical form of Voldemort may be weakened and our young heroes will be given a better chance to defeat him. While last years part 1 was very much a somber, slow-paced film it dealt with a much different part of the story than this second half does. 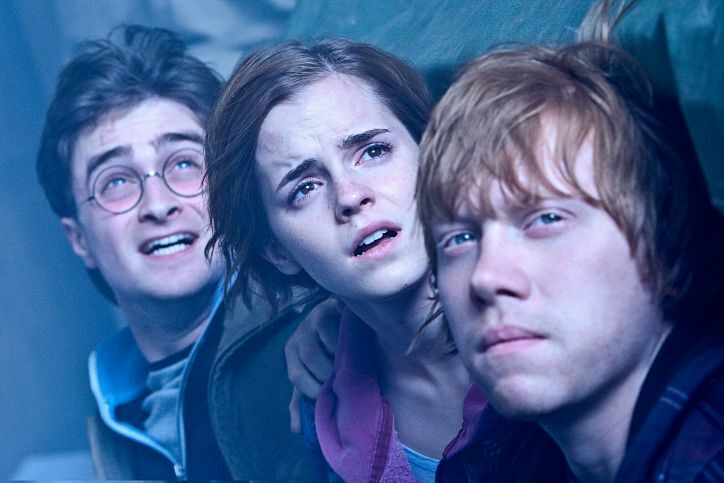 That first part, along with being what we knew was the beginning of the end was also about these characters finding out who they were outside of Hogwarts. Their entire friendship had been based around this school, this structure of time and routine. We saw all that fall away in part 1 and were given a stripped down character study almost as to how much these characters had grown since first sitting on the stool and having the sorting hat placed on them. And not just the characters, but the actors playing them as well. When we began this journey we knew nothing about our three leads, but over the past ten years we have not only watched them become more and more the characters they are playing on screen, but we have gotten to know them and witnessed them grow up. It is a quality unique to this franchise and at its core is really what makes these films so successful both critically and commercially. "The Deathly Hallows Part 2". Daniel Radcliffe has truly never been better as Harry here. This final chapter of the series asks alot of our young hero and he is able to deliver if not exceed every challenge that is given to him. Harry must not only face off with Voldemort one on one but he must witness years of built up frustration and mystery diminished in a few seconds and respond accordingly. he must solidify his love for young Ginny as well as witness his two best friends finally admitting they love one another. He must relay that heroic quality about Harry that mixes with stubbornness that allows him to let others help him and to not place the entire weight of the survival of the magical world on his own shoulders. Through all of this Radcliffe displays a firmer and more full understanding of who Harry is and who Radcliffe himself has made him to be. In no better way could "The Deathly Hallows Part 2" have made Harry Potter the hero he needed to be in a more credible or deserving way. As Ron and Hermione, Rupert Grint and Emma Watson continue to play their less pressured but just as high profile roles with ease and understanding. In this final entry we are given the moment many of the series fans have been waiting for since the books even began hinting at a romance between Ron and Hermione. To see these two great young actors fight for one another and kiss like adults just to giggle afterwards as if they were young children fully encapsulates everything that is meaningful about this series. To be given bits of almost every other minor character in the Potter universe, some of whom get a considerable of screen time than ever before, is also one of the many gems of part 2. Whether it be Neville Longbottom, Mrs. Weasley, or Professor McGonagall it is a joy to watch each of them get the moment they deserve and just as heartbreaking to see their faces when all hope seems lost. thngs once and for all. The key ingredient of Harry Potters final stand though is what he stands against and that evil has always been distributed evenly among two definitive opponents. Of course there is Lord Voldemort who, as played since film four by the wonderfully menacing Ralph Fiennes, is the key to making right all that is wrong with the wizarding world and then there is Severus Snape whose story is a bit more complicated. As he has played him in all previous chapters, Alan Rickman excels once again and really deserves some recognition for this most complicated character he has delivered flawlessly over the years. The audience has known since day one at Hogwarts that there was something off about Snape, that an underlying reason was given to his especially strong distaste for Harry Potter, and as the series has moved along that relationship has become not only more and more complicated but muddier as well. Snape's motive's always unclear, his action not always seeming to make sense. One of the most beautiful things about "Harry Potter and the Deathly Hallows Part 2" is the way the film so elegantly wraps up the story of Severus Snape. I won't give any spoilers away here, especially if you haven't read the book, but to see that true intent of Snape show through, to be given that glimpse behind the curtain and share in one especially touching moment between Snape and Harry is to have witnessed the full circle in which this final film brings the entire eight-film saga. From the wonderfully executed Gringotts break-in sequence to that final stand-off between Harry and Voldemort, "The Deathly Hallows Part 2" hardly stops to take a breather, but it never feels overloaded and each large action sequence is filled with more meaning and substance than any cinephile could ask for out of a big budget hollywood film. This is a more than satisfactory conclusion to a series I myself have been enthralled with since I was 12 years-old. It is packed to the brim with action, loaded down with emotional punches and we mere muggles should just be happy that such credible and high quality films have been made out of what is no doubt one of the best literary works of many generations. I cannot imagine the disappointment I would have felt had these film adaptations been turned into mainstream Hollywood money-grubbers, and can appreciate how lucky we are as an audience to have been given eight films that have truly been cared about enough to justify that source material to the loyal and devoted fans as well as being strong enough to convert others who would never have picked up one of the books. Harry Potter ends just the way it should, our three heroes still friends and defining the meaning of that friendship in a touching epilogue that tells the audience things will be okay, even if we know we will never catch a glimpse of them on the big screen again.